Randomised controlled trials are the best way to compare the effectiveness of different interventions. Only randomised trials allow valid inferences of cause and effect. 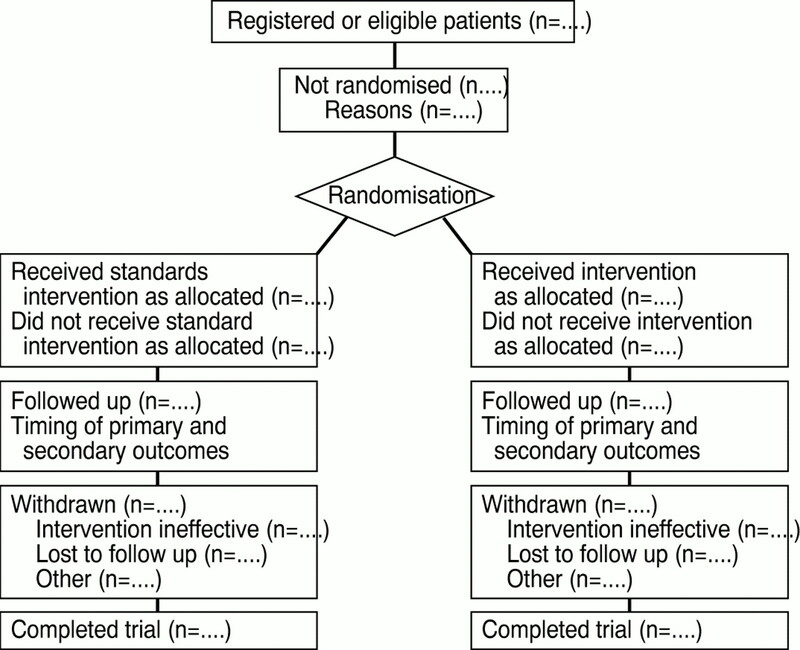 Only randomised trials have the potential directly to affect patient care—occasionally as single trials but more often as the body of evidence from several trials, whether or not combined formally by meta-analysis. It is thus entirely reasonable to require higher standards for papers reporting randomised trials than those describing other types of study. Like all studies, randomised trials are open to bias if done badly.1 It is thus essential that randomised trials are done well and reported adequately. Readers should not have to infer what was probably done, they should be told explicitly. Proper methodology should be used and be seen to have been used. Yet reviews of published trials have consistently found major deficiencies in reporting,2 3 4 making the task for those carrying out systematic reviews much harder. Almost 50 years after the first publication of a randomised trial,5 the guarantee of adequate reporting of these important studies is surely long overdue. In 1994 two groups independently published proposals for requirements for the reporting of randomised trials.6 7 In an editorial in JAMA Drummond Rennie suggested that the two groups should combine to produce a unified statement,8 and the outcome of this process was published last week.9 The new CONSORT statement lists 21 items that should be included in a report (see table 1) as well as a flow chart describing patient progress through the trial (fig 1). In addition, a few specific subheadings are suggested within the methods and results sections of the paper. In the spirit of the times, the recommendations are evidence based where possible, with common sense dictating the remainder. The BMJ supports the CONSORT statement and is adopting its recommendations. So too are JAMA, Lancet, and some other journals. Trialists are encouraged to follow the statement right away, but from 1 January 1997 they will be required to do so. Authors should submit with their papers a copy of the completed checklist indicating on which page of the manuscript each item is addressed. The checklist will be used by the editors and supplied to referees. In the published papers the BMJ will use the additional subheadings suggested by CONSORT. It seems reasonable to hope that, in addition to improved reporting, the wide adoption of this new publication standard will improve the conduct of future research by increasing awareness of the requirements for a good trial. Such success might lead to similar initiatives for other types of research. .Empirical evidence of bias. Dimensions of methodological quality associated with estimates of treatment effects in controlled trials.JAMA1995;273:40812. .Reporting standards and research strategies for controlled trials. Agenda for the editor.Controlled Clin Trials1980;1:3758. .Statistical problems in the reporting of clinical trials.N Engl J Med1987;317:42632. .Assessing the quality of randomization from reports of controlled trials published in obstetrics and gynecology journals.JAMA1994;272:1258. .Streptomycin treatment of pulmonary tuberculosis.BMJ1948;ii:76982. .A proposal for structured reporting of randomized controlled trials.JAMA1994;272:192631. .Call for comments on a proposal to improve reporting of clinical trials in the biomedical literature: a position paper.Ann Intern Med1994;121:8945. .Reporting randomised controlled trials: an experiment and a call for responses from readers.JAMA1995;273:10545. .Improving the quality of reporting of randomized controlled trials: the CONSORT statement.JAMA1996;276:6379. .The use of checklists in assessing the statistical content of medical studies BMJ1986;292:8102. .Subverting randomization in controlled trials.JAMA1996;274:14568.